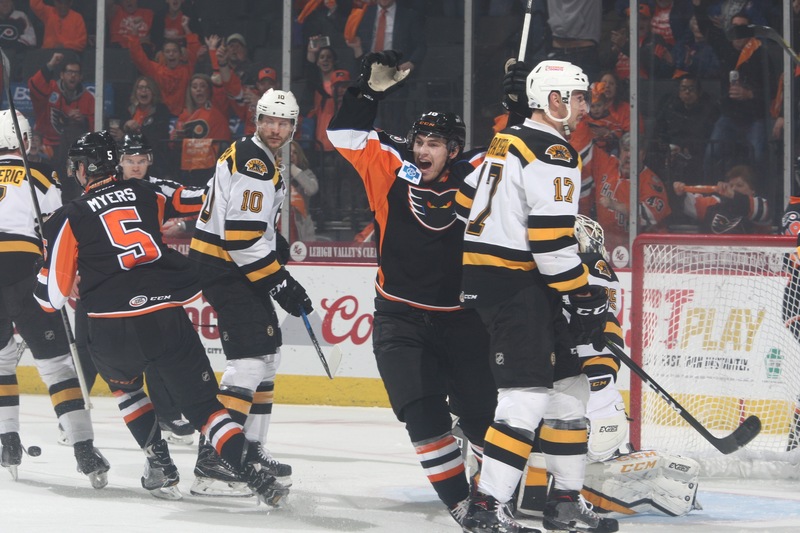 Lehigh Valley, Pa. – The Lehigh Valley Phantoms scored both shorthanded and on the power play Friday evening in earning a pivotal 4-1 victory over the Providence Bruins in Game 3 of their best-of-five Atlantic Division Semifinals series. Game 4 is set for Saturday evening back in downtown Allentown as the Phantoms have an opportunity to advance to the second round of the 2018 Calder Cup Playoffs for the first time since 2008. A limited number of tickets remain for Saturday’s highly-anticipated postseason showdown and are available HERE. 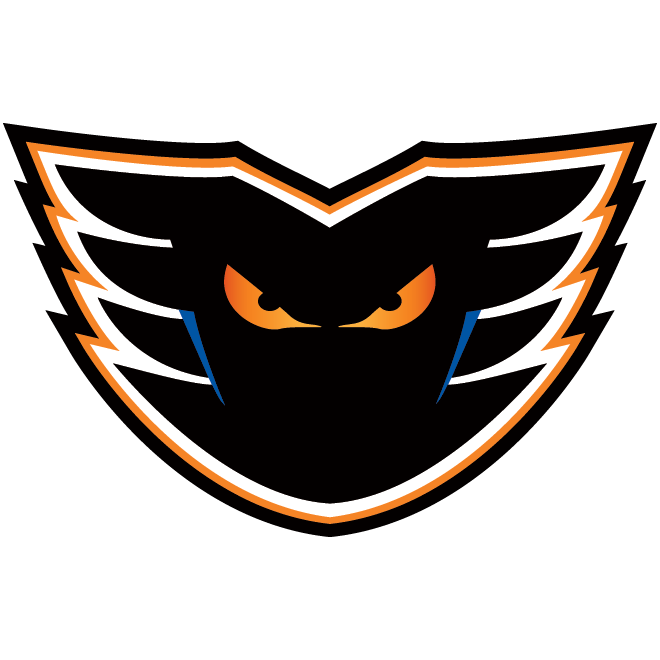 Friday’s victory was the Phantoms’ first home playoff win since arriving in the Lehigh Valley and franchise’s first home postseason victory since the Philadelphia Phantoms outlasted the Albany River Rats back on April 29, 2008. What’s more, Friday’s win was the team’s eighth straight triumph in downtown Allentown as the Phantoms have now posted an impressive 18-1-2 mark at home since January 13. 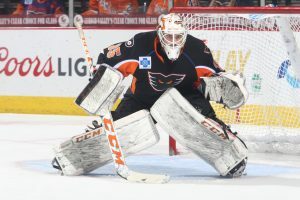 Fresh off a Stanley Cup Playoffs run with the Philadelphia Flyers, Oskar Lindblom (1st, 2nd) scored twice for Lehigh Valley while Phil Myers (1st) and Mike Vecchione (2nd) rounded out the scoring for the Phantoms in front of goaltender Dustin Tokarski who backstopped the triumph with an impressive 32-save performance. The 28-year-old netminder turned aside all 16 third-period shots he faced in claiming his sixth straight victory at PPL Center. 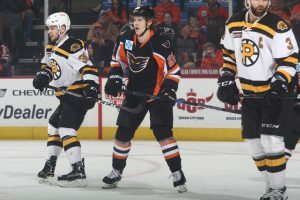 Lindblom made an immediate impact in his return to Lehigh Valley’s lineup as he scored both shorthanded and the power play as part of an impressive night for the Phantoms’ special teams. 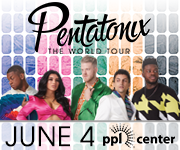 Lehigh Valley went 1-for-2 on the power play Friday evening while successfully thwarting four of Providence’s five man-advantage chances. The Phantoms have now converted on the power play in each of the first three games of the series and are an impressive 4-for-10 on the man-advantage overall. 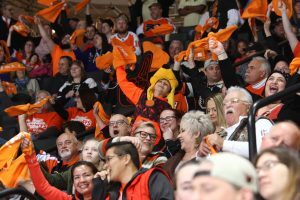 Friday’s victory came in front of a raucous crowd of 6,956 orange-clad spectators who Oranged Out PPL Center giving the Phantoms just the home-ice advantage they were looking for. 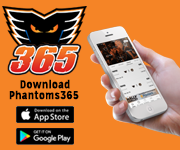 The Phantoms gave their fans reason to cheer early as they opened the scoring just over six minutes into the contest when a drop pass by Vecchione found a streaking Myers in the slot who promptly snapped home his first goal of the playoffs. Vecchione and Danick Martel assisted on the even-strength strike scored 6:05 into the first period as Lehigh Valley fired the game’s opening salvo for the first time in the series. 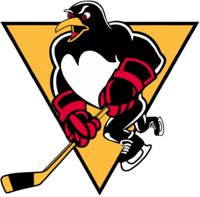 The Phantoms then doubled their lead less than seven minutes later when, with Tyrell Goulbourne in the penalty box for roughing, Cole Bardreau’s wrist shot from the right wing produced a rebound in the slot that was quickly hammered home by Lindblom for his first conversion of the postseason. Bardreau collected the only assist on the shorthanded conversion netted 12:50 into the opening period of play. 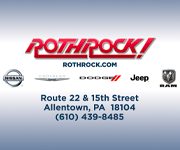 Lehigh Valley then swelled its edge to a 3-0 advantage just over two minutes into the second period when the special teams struck again. 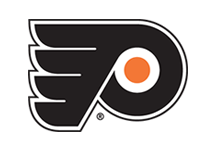 While on the power play with Providence’s Ryan Fitzgerald in the box for tripping, Travis Sanheim fed a perfect touch pass to the top of the goal crease that was deftly tapped in by Lindblom for his second goal of the game and second of the playoffs. Phil Varone garnered the secondary assist on the man-advantage marker notched 2:06 into the middle stanza. 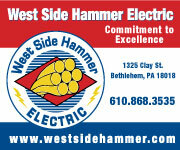 Providence sliced into Lehigh Valley’s lead with a power play goal of its own 13:42 into the second period. With T.J. Brennan off for a double-minor roughing penalty, Austin Czarnik snapped a heavy wrist shot from the top of the right wing circle that clipped Tokarski’s shoulder before settling into the back of the Phantoms’ net. Tommy Cross and Kenny Agostino collected assists on the man-advantage marker. 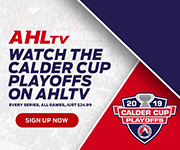 The Phantoms landed the game’s final strike though with just under five minutes left in regulation when Chris Conner’s right wing shot produced a rebound atop the goal crease that was promptly punched in by Vecchione for his second goal of the playoffs. Conner collected the only assist on the five-on-five conversion tallied 15:16 into the final frame. 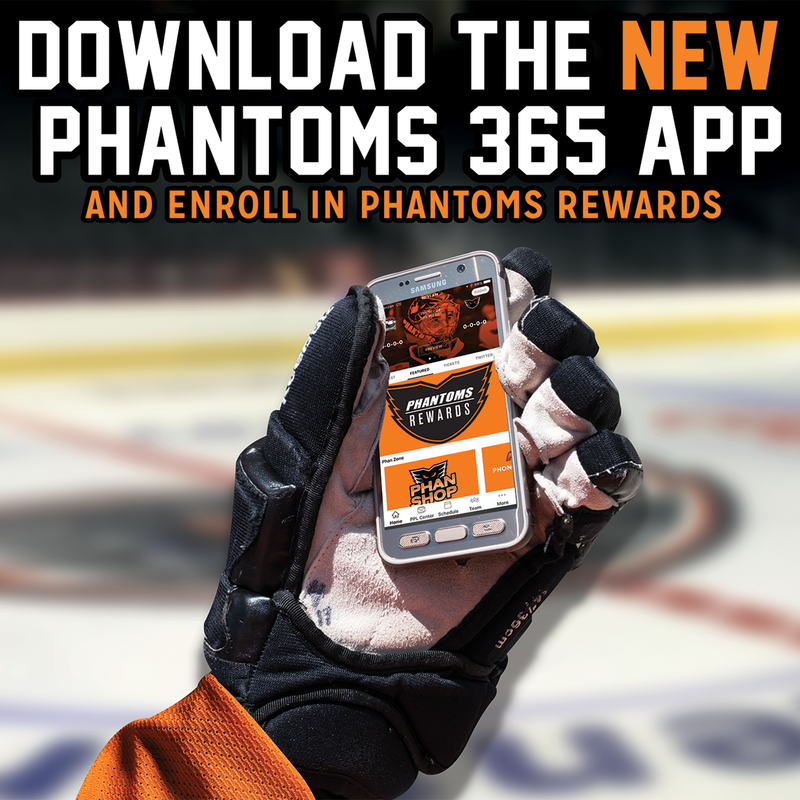 In the midst of the club’s 12th postseason appearance in franchise history, the Phantoms have captured two Calder Cup Championships (1998, 2005) and carry a 60-53 overall mark in 113 career AHL postseason outings. This is the fifth regular season division title in franchise history and the team’s first since arriving in the Lehigh Valley.